8-10 inches of root development 6 weeks after our first organic lawn treatments. 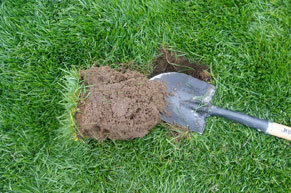 Longer roots will reduce water usage. Early May 2009: Improve the turf (highly used not only by humans but also dogs). Much of the turf was spotty and thin with no consistent color. We top dressed with quality compost, aerated the soil, and applied a protozoa compost tea, and then top-dressed with compost and seed again. 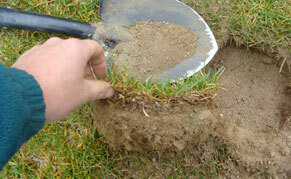 Result: Within a four-week period, turf roots went from 2-3 inches to a rooting mass of almost 10 inches deep. Turf was still slow to grow but color darkened compared to the other parks. Early June 2009: An organic fertilizer and another compost tea was applied and grass flourished. The comparisons between the northern plots and the lower parks are dramatically different.